If, like many people, you find Mondays just too much to cope with, you might want to avoid today’s app. It’s not the sort of thing that’s going to make your Monday feel any better, and in some cases it will just fry your brain until next Monday. Which would be a shame, because you’d miss out on a whole weekend. 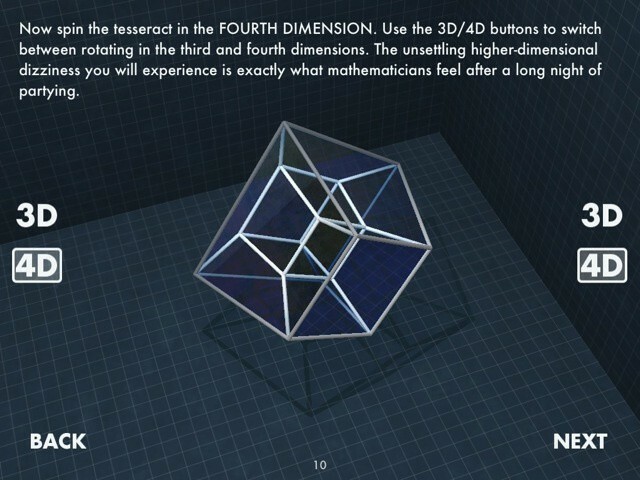 Be forewarned, then: The Fourth Dimension is an app which will mess with your head. Deliberately. Even though the aim is education and expansion of knowledge, it will still mess with your head. You will emerge from the experience only fractionally the wiser, and quite a lot more confused than you were at the beginning. Don’t worry, this is perfectly normal. The aim of the app is to explain four spatial dimensions to creatures like us who live in a stubbornly three dimensional universe. Stop for a moment and consider that statement. We can perceive only three dimensions, yet science tells us there are others. How on earth can a humble iOS app make something as mind-scrambling as the fourth dimension understandable to dim ape-descendants like us? The answer is: very well, and very cleverly. The app uses a combination of ingenious diagrams, understandable metaphors, and amusing copy to take you through a series of steps. That's a tesseract, that is. I think. I need a lie down. Just as our three-dimensional universe would be hard for a two-dimensional creature to grasp, so the 4D world is beyond our understanding. At first. But with some help from this app, you can begin to appreciate that which lies beyond our perception. 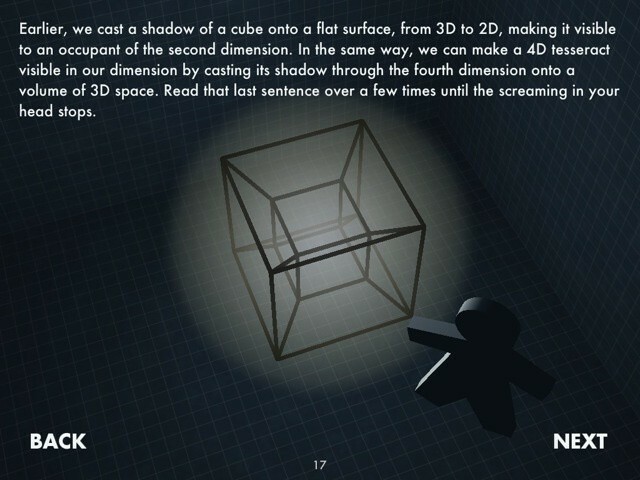 Soon, you’re manipulating a four-dimensional shape called a tesseract, in both three and four dimensions. No, honestly, trust me. It makes sense at the time. You’ll forget everything in minutes and be forced to go through it all again, but that’s not a bad thing. Of course, afterwards you might be trying to explain it all to a friend and you’ll soon find yourself hopelessly confused. That’s why this app is totally worth the three dollars you’re asked to pay for it. Not only can you blow your own mind over and over again, you can also enjoy watching your friends’ minds being blown in front of you.